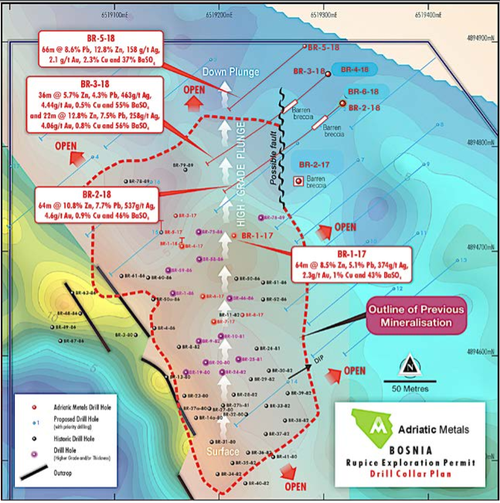 Yesterday Finfeed.com provided commentary on the drilling and assay information released aftermarket on Monday by Adriatic Metals’(ASX:ADT). 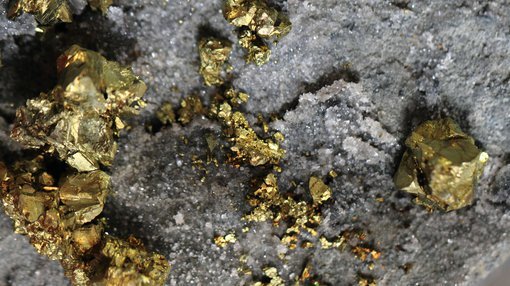 This related to the company’s polymetallic (featuring high zinc grades) Rupice Project in Bosnia, with that broader region of former Soviet states drawing substantial attention from multinational miners in recent years due to the high grade long life deposits that have been identified. While management was able to appraise investors of assay results from the recent hole BR-4-18 and advised that the drilling of BR-6-18 had been completed, some outstanding news regarding hole BR-5-18 was in the offing. Of course, ADT remains a speculative stock and investors should seek professional financial advice if considering this stock for their portfolio. This morning’s update based on recent drilling confirmed a further high-grade and thick intercept, extending mineralisation north of Rupice. The intercept included 66 metres at 2.1 g/t gold, 158 g/t silver, 2.3% copper, 8.6% lead, and importantly an extension of the very robust zinc grades which were 12.8%. These results extend the high-grade mineralisation approximately 110 metres down-dip from an historical hole. This hole’s proximity and similar geological features to another high-grade hole situated only 40 metres to the north highlights the continuity and thickness within the interpreted northern mineralisation corridor, suggesting the potential for further exploration upside. The landscape changes just as quickly in the investment world as it does at the mine site. The release of further news just before the market opened on Tuesday morning piqued investor interest as can be seen in the following chart that maps trading from the open. Importantly, this rerating has been driven by the second highest trading volumes ever recorded by Adriatic. It shows this rise has been driven by the second highest trading volumes ever recorded by Adriatic. , In fact, this morning’s development resulted in the company’s shares surging more than 15 per cent in morning trading. As we said this morning, only limited drilling to date has already resulted in extensions to known mineralisation, as well as confirmation that the resource remains open at substantial widths in several directions. Consequently, updated results don’t in isolation provide an accurate guide as to the big picture, but they are providing management with valuable information in terms of understanding the highly prospective territory at the Rupice Project. However, it is hard to argue that results such as those released this morning that feature such impressive thicknesses and high zinc grades don’t bode well for the company. Adriatic’s chief executive, Geraint Harris commented, “BR-5-18 represents not only another significant extension to the north and once again down-dip at the Rupice North Zone, but it also demonstrates a remarkably consistent geology, thickness and a high-grade metal assemblage akin to the other holes we have drilled in this area. “Our ongoing exploration programme continues to enhance our understanding of the stratigraphic and structural controls on the mineralisation corridor at Rupice North.